1. the action of an agglutinant substance. 2. the clumping together in suspension of antigen-bearing cells, microorganisms, or particles in the presence of specific antibodies (agglutinins). Agglutination reactions. From Applegate, 2000. 3. the process of union of the surfaces of a wound. adj., adj agglutina´tive. cross agglutination the agglutination of particulate antigen by an antibody raised against a different but related antigen; see also group agglutination. group agglutination agglutination, usually to a lower titer, of various members of a group of biologically related organisms by an agglutinin specific for one of that group. For instance, the specific agglutinin of typhoid bacilli may agglutinate other members of the colon-typhoid group, such as Escherichia coli and Salmonella enteritidis. intravascular agglutination clumping of particulate elements within the blood vessels; used conventionally to denote red blood cell agglutination. platelet agglutination the clumping together of platelets owing to the action of platelet agglutinins; such agglutinins are important in platelet typing. agglutination test any test based on an agglutination reaction, as serologic tests for specific antibodies. 1. The process by which suspended bacteria, cells, or other particles are caused to adhere and form into clumps; similar to precipitation, but the particles are larger and are in suspension rather than being in solution. For specific agglutination reactions in the various blood groups, see Blood Groups Appendix. 2. Adhesion of the surfaces of a wound. 3. The process of adhering. 2. the process of union in wound healing. cross agglutination the agglutination of particulate antigen by antibody raised against a different but related antigen; see also group a.
group agglutination agglutination of members of a group of biologically related organisms or corpuscles by an agglutinin specific for that group. intravascular agglutination clumping of particulate elements within the blood vessels; used conventionally to denote red blood cell aggregation. 1. The act or process of agglutinating; adhesion of distinct parts. 2. A clumped mass of material formed by agglutination. Also called agglutinate. 3. Physiology The clumping together of red blood cells or bacteria, usually in response to a particular antibody. 4. Linguistics The formation of words from morphemes that retain their original forms and meanings with little change during the combination process. the clumping of cells or particulate antigens as a result of interaction and crosslinking with agglutinins. agglutinate, v.
Lab medicine The clumping of aggregates of antigens or antigenic material-eg bacteria, viruses, with antibodies in a solution. See Latex agglutination test Reproductive biology The conjoining of 2 organisms of the same species for sexual reproduction, which may be mediated by a carbohydrate on one organism and a protein on the other, thereby forming a glycoprotein. 1. The process by which suspended bacteria, cells, or other particles are caused to adhere and form clumps; similar to precipitation, but the particles are larger and are in suspension rather than being in solution. The clumping and sticking together of normally free cells or bacteria or other small particles so as to form visible aggregates. Agglutination is one of the ways in which ANTIBODIES operate. From the Latin ad , to and glutinare , to glue. a clumping together of cells, usually as a result of reaction between specific ANTIGENS and ANTIBODIES in blood and lymph, forming a natural defence against foreign materials, including bacterial cells. Transfusion of blood between persons of different ABO BLOOD GROUPS is also subject to the risk of agglutination (see UNIVERSAL DONOR and UNIVERSAL RECIPIENT). Agglutination is a different process from BLOOD CLOTTING. 1. The process by which suspended bacteria, cells, or other particles are caused to adhere and form into clumps. n the aggregation or clumping together of cells as a result of their interaction with specific antibodies called agglutinins, commonly used in blood typing and in identifying or estimating the strength of immunoglobulins or immune sera. aggregation of separate particles into clumps or masses; especially the clumping of bacteria or blood cells by antibody specific to, or directed against, surface antigenic determinants. See also agglutinin. a diagnostic procedure that employs serum or other body fluid of unknown antibody titer, titrated with standard suspension of bacteria as antigen. These may be performed quantitatively in 96-well microtitration plates or qualitatively on slides. the agglutination of particulate antigen by an antibody raised against a different but related antigen; see also group agglutination (below). agglutination—usually to a lower titer—of various members of a group of biologically related organisms by an agglutinating antibody made to one of that group. clumping of particulate elements within the blood vessels; used conventionally to denote red blood cell agglutination. see passive agglutination test (below). one in which the test mixtures are examined microscopically to detect the agglutination. an agglutination reaction in which a soluble antigen, such as gonadotropin, is linked to inert particles such as latex beads or tanned erythrocytes. the clumping together of platelets owing to the action of platelet agglutinins. 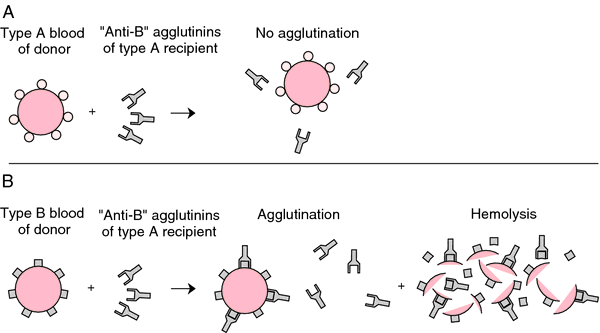 Such agglutinins are important in platelet typing. a rapid screening or semiquantitative test in which antibody and antigen are mixed on a glass slide and observed for agglutination. see bacterial agglutination test (above). an agglutination test for the identification of bacteria carried out in a test tube, a positive reaction consisting of a clearing of a prior opalescence. A Dot enzyme-linked immunosorbent assay which used a proteinase-K resistant antigen (PK-Dot-ELISA) to detect antileptospiral IgM antibodies was compared to the microscopic agglutination test (MAT). paragraph] The microscopic agglutination test (MAT) and immunoglobulin M ELISA were used for laboratory confirmation. serovars Pomona and Bratislava, the association of chronic interstitial nephritis with positive results of the microscopic agglutination test, and the demonstration of leptospires in kidney specimens all indicate that wild boars act as a maintenance host for Leptospira spp. Diagnosis was performed serologically by microscopic agglutination test with a panel of Leptospira reference strains (3). Seropositivity for Leptospira serovars in dogs by the microscopic agglutination test using canine sera, 2002-2004 * Positive test results [greater than or equal to] 400 Serovar Total tests (n) n % (95% CL) Autumnalis 11,621 1,059 9. Results of paired acute- and convalescent-phase serologic testing for dengue immunoglobulin M (IgM) and IgG were negative, as were the microscopic agglutination test for leptospirosis and the Widal test for typhoid. All blood samples were sent to the Leptospira referral laboratory at the Indian Veterinary Research Institute, Izzatnagar, for microscopic agglutination test (MAT). Serologic diagnosis of leptospirosis: comparison of line blot and immunofluorescence techniques with the genus-specific microscopic agglutination test.